In my opinion college students are the best investors. They are constantly learning and not afraid to make mistakes. As you get a college education, you should be getting an education in building wealth. You don’t need tons of capital to start your investing journey: you just have to know how to do it. This article will focus on the most popular option for college investors: online investing. 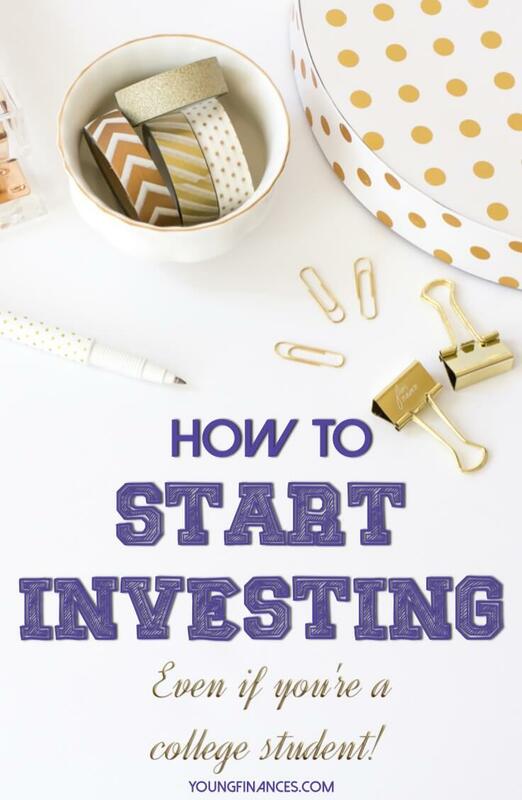 If you are wondering how can a college student invest here are some tips to get you started. When you first start investing you will most likely want to start with stocks. The reason most first time investors start with stocks is that they are easy to relate to and they are widely discussed. You can start up a conversation about stocks with almost anyone and they should be able to voice at least an opinion. While some believe that there are certain best stocks for college students, I believe a general education on how to invest is important. According to financial experts, college investors have a significant advantage over other types of investors. They have time – lots of it. Considering the amazing powers of compound interest (i.e. a type of interest that earns additional interest), we can say that time IS money. Experienced investors state that even a small amount of money, if invested properly, can reap huge profits in the future. That means you really have to think about building your personal investment portfolio while you are still in college. If you are beginning with small capital (e.g. $25 to $50), find a broker that will accept the small account. Then, you can increase your overall capital by investing more money on a regular basis. You should calculate the total amount of money you are willing to risk. As a college investor, you have to keep in mind that investment always involves risk. Your personality and available funds are two of the most important factors that determine your "risk tolerance." If you like to take risks, the possibility of earning large profits probably outweighs your fears of losing money. If you are risk-averse, on the other hand, you have to perform serious calculations regarding the exact amount that you are willing to risk. There are savings vehicles that guarantee profits and offer minimal risks. Here are some examples: certificate of deposits, federal savings bonds, student savings accounts approved by the FDIC, etc. Yep, I'm talking about saving accounts, CDs and other bank saving products. In general, these financial instruments provide the best protection against risks. However, they also involve the lowest potential for getting large profits. If you will invest in these instruments, your earning potential will be severely limited. If you can shoulder more risk and invest your money for a longer time period, you may try investing your capital in mutual funds or exchange traded funds (ETFs). These funds are composed of various securities such as bonds, stocks and commodities. Mutual fund corporations collect and manage the money of other people for investment purposes. Since these corporations employ financial experts, lots of college investors opt to put their money in mutual funds or ETFs. Prior to investing your hard-earned money in these mutual funds, you have to perform your own background research. Some mutual fund companies focus on particular industries (e.g. pharmaceutical, telecommunications, banking, etc.) while others use diversified portfolios (i.e. they make investments in different industries). You should research about the past performance of the company you will be investing on and the industries they work with. Remember: The past performance can in no way guarantee future results. How Can a College Student Invest in Stocks? As a college investor, once you become familiar with how the financial market works, you can start to invest in individual bonds or stocks. You can do this through the help of online brokerage firms. Individual investments, as the name implies, require the investor to personally manage all of the securities that he/she owns. This might sound a bit scary. However, there are lots of tools that you can use to simplify your investment decisions. Almost all online brokerage firms provide their clients with reliable tools to monitor their investments. These days, lots of investment companies offer free accounts and minimal balance requirements. That means you can start your personal investment portfolio today. You may think that investing is difficult or that it is hard to get started. That is not the case. Beginning your investing journey is as easy as opening an investing account. I used to have a few accounts with different brokers because I liked them for different reasons. Now I just have a few ETFs and stocks. For example, I can buy stocks with an Ally Invest account. But I also like them because I can invest automatically without choosing stocks; you can open an account here with no minimum. Lesson 1: What is a Stock? A stock or a share, is an ownership interest in a business. A publicly traded business will use stocks, also called equity, to raise capital. As a stockholder, you own a piece of a business. You have the right to vote on certain changes, and you should be involved in the process. Figuring out what stocks to choose is the tough part. I remember when I made my first investments. I bought stocks based on what reporters were discussing on tv. And I lost horribly. After a few years, I learned how to research stocks and invest with the markets, not against them. I was a college student investing with extra cash and I enjoyed the process. Once you’ve placed a few trades and are confident in your abilities, it’s time to put some muscle behind your trades. You can beat the stock market if you make the choice to research your trades and take the time to follow the markets carefully. This is where you have to do your homework and it’s really not that hard. Fundamental analysis is looking at the story behind the price changes whereas technical analysis is looking at the previous price changes to determine a future. The following tips are recommended by financial experts. You should consider these before or while investing your money in the markets. Learn as much as you can – You can acquire investing knowledge and techniques just by reading reliable investing books and articles. The pieces of information you can gain from these resources can help you become a successful investor. Eliminate high interest debts – Debts (especially those with high interest rates) should be paid off first before making any investment. Risking your money in investments while having high interest loans can greatly worsen your financial condition. Select a brokerage firm - If you really want to make investments, you have to create a brokerage account. You have two options here: online firms and traditional firms. Online brokerage firms offer easy and computerized investment systems. However, traditional firms may provide personal advice and services. Diversify your portfolio – Investing all of your funds in a single company can result in financial disaster. Consider putting your money in various industries and investment vehicles. This strategy is called “portfolio diversification.” Even if you think an investment is a "sure thing" never put all of your eggs in one basket. A diversified portfolio is recommended. It’s hopefully no secret that investing is the way to build wealth. Stock piling your money in a savings account won’t help you become a millionaire, or even help you achieve your financial goals. Unfortunately, there are a lot of concerns and excuses that young professionals like to throw around that keep them from investing. I hope to dispel a couple of them in this post and to help motivate you to look at investing! 1) Investing is for rich people. How do you think most of those people got rich? Not by sitting around and working their 9-5 job! It only takes a little bit of money to get into investing, and anyone can start trading stocks online! 2) I just don’t have enough money to make it worthwhile. It’s the principle of the matter; if you can learn to make a little bit of money, you can learn to make a lot of money! 3) I just don’t have time. Let’s face it; what young professional does? The fact is, if you don’t purposefully make time for your finances, they’ll easily slip out of control for you. It actually doesn't take all that much time to research and invest your money, plus there are now more and more affordable services online (Ally Invest, Learnvest) for you to pay a nominal fee to have your money invested. 4) There are too many options out there to invest in. Well, you've gotta start somewhere. Try picking one good mutual fund or an index fund. This is a quick way to diversify your money and lessens the risk of just picking one stock. That’s a fair point. Firstly, never put more money in than you could see decline. You should always keep an emergency fund as well as a nice pile of cash in the bank before you start investing. Secondly; no risk, no reward. You have to be willing to take a risk with your money in order to get the reward of actually making money. Thirdly; start small and safe with your investing. Don’t go investing in high tech companies that you don’t even understand their business model. Although you won’t ever eliminate the risk, you can certainly learn to mitigate it. 6) I already have a retirement fund, why should I invest more money? Firstly, good for you for having a retirement fund! Take a look at your savings account right now, how much interest is it paying? I’d be surprised if you said more than 1%. Inflation in 2013 here in the US was 1.5% last year. That means that your money essentially lost some of its value just sitting in the bank. Although you shouldn't go out and invest all of your money in the market, investing more than $0 would be a good start. By investing early, you’ll hopefully be able to enjoy years of compounding interest and will see you total net worth grow!